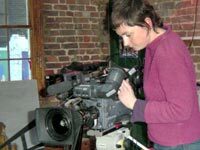 Most of my video camera courses are made up from a core of subjects such as focus, white balance, exposure and sound. Then I add in exercises that meet your specific needs based upon the your current abilities, the kit you will be using and the type of projects you'll be working on. Perhaps you want to concentrate on interviews and vox pops, lighting with a pro kit or available light. Maybe you're confindent with a XF305, but need help moving up to a another camera like the Sony PMW-200 or Canon C300. Perhaps you want to move from stills to video. Find out more about booking a one-to-one course or group training sessions. If you contact me I'll put together a day that is just right for you. I am often asked to explain what I can do in a day... So here are some examples below. They are just suggestions to show what can be done. Beginner's introduction to shooting sequences and interviews. This first example is pretty much all about the technology. It is useful for beginners who are struggling with badly written manufacturers' manuals. H.264, AVCHD, MXF,---16:9, 1920X1080, 1280X720, 50Mbps, 35Mbps, 24p, 25p, 50i what the numbers and letters mean and why you need to choose carefully before you start shooting. Messages in the viewfinder and what they mean. Microphones (omni, cardioid and hypercardioid). This example would be suitable for someone who is happy with most of the buttons and actually wants to start getting creative. 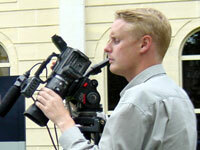 It works well if you intend to shoot news, documentaries, corporate videos, electronic press kits (EPK) or drama. H.264, AVCHD, MXF---16:9, 1920X1080, 1280X720, 50Mbps, 35Mbps, 24p, 25p, 50i what the numbers and letters mean and why you need to choose carefully before you start shooting. Hyperfocal distance for shooting on the move. Using Final Cut Pro X or Adobe Premiere Elements - we'll put the sequence you've shot onto the computer and see if it does edit together. In the last couple of years I've been getting more and more enquiries from professional stills photographers for video training. Many of the newspapers they work for want video for their websites and so they are being asked if they will start shooting video too. You're used to RAW, JPEG, PNG and TIFF . But, we have H.264, AVCHD, MXF ---16:9, 1920X1080, 1280X720, 50Mbps, 35Mbps, 24p, 25p, 50i .....what the numbers and letters mean and why you need to choose carefully before you start shooting. Shooting a simple sequence (eg someone reading a newspaper). Using Final Cut Pro X or Adobe Premiere Elements we'll put the sequence you've shot onto the computer and see if it does edit together. We'll probably need to have a good rummage in the menus too. Something I hear a lot is: "I've never been formally trained and want to make sure I am doing things right." These guys usually just want to come along for a day's training and ask lots of questions. Some bring along DVDs of stuff they have already done(or send me links to their online videos) and ask advice on problems they had or help on how they could improve. It is a very unstructured day and I'm never sure what I'll be asked. Often the person I'm helping may not have all the questions in their head when we start. But, as we go through one topic - other questions emerge. We go off on tangents because that new subject was important to talk about (something you can't do on a group course). Maybe they have a big project coming up and want to talk over ways of doing things. We try stuff out, experiment. There is no timetable - but we always seem to get a lot done. "Thank you for your patience on Friday, I really enjoyed the day and learnt lots. You are a very good teacher. "Hi Christina - Just a short note from a very satisfied customer to say thank you for the training on Friday - I think you literally answered every question I had! With a tasty lunch thrown into the bargain, it was an extremely worthwhile day. Many thanks." "Excellent - sound advice which I needed, and a chance to ask lots of 'dumb' questions without feeling dumb." "Very many thanks for yesterday. I only wish I had been Christina'd a couple of years ago. Would have saved me so much headache/panic and deep, deep frowns from long suffering video editors. I read every word of your manual last night. By far the best of its kind I've come across. It will be part of the kit from now on. These are the most popular video cameras. But, I can also do other cameras on request. Interested in being trained one-to-one? Or maybe you're putting together training for a group of people?